Let’s talk about something almost everyone puts in their salads. It’s the amazing cucumbers, yes you think of them as a veggie but they really are in the fruit family. After I tell you about how great they are, I am sure you will feel guilty from not including them in your daily regime. Cucumbers are in the family of squash and melons. There are several different varieties. The longer thick skin ones for slicing, and the thin skin shorter ones for pickling. Everyone focuses on the powerhouses known as broccoli, cabbage and cauliflower. Did you know that cucumbers contain lignans? Three in fact (lariciresinol, pinoresinol, secoisolariciresinol) these are associated with reducing the risk of cardiovascular disease. Protecting against ovarian uterine prostate and breast cancers. WOW this little cucumber is a nutritional powerhouse. It contains B vitamins, vitamin C, vitamin K1, copper, potassium, manganese and fiber. Eat one daily!!!!!! Do you need an Energy Boost? The carbs and B vitamins in a cucumber provide sustaining energy for hours instead of that coffee (which by the way contributes to adrenal fatigue if you drink more than 1 cup). So, CHOMP away. Reach for that cucumber. Oh, did I forget to mention it also contains electrolytes and it can help keep you hydrated. Cucumbers also help reduce sugar cravings. So, keep some slices cut up with a little sea salt and sprinkle a little pepper and enjoy as a snack. Boil cucumbers in water over the stove and add a few drops of lavender oil, this combination reduces anxiety and stress when you breathe in the aroma of the cucumber and lavender mixture. Give it a try next time someone or thing stresses you out. Breathe in those cucumber aromas for at least 5 minutes. Let me know what you think. Yes, you read correctly…stinky breath. Cucumbers contain phytochemicals that kill the bacteria that cause bad breath better than the sugary breath mints or the artificially sweetened ones. Also, eat a slice after you have your coffee so you don’t have that coffee breath. A few slices keep you fresh all-day long. Yes, there are many reasons why you can experience constipation. Stress, medications, high processed diet, whatever the reason cucumbers can help. They are high in fiber low in calories and can help keep you regular. Eat 1 to 2 daily (ORGAINC PLEASE) or else you must peel the skin and you lose most of the fiber. Cucumbers contain high levels of potassium that can help regulate blood pressure by boosting electrolyte levels and counter effects the damaging sodium over consumption. There are so many more benefits but I almost forgot, LADIES, puffy eyes? 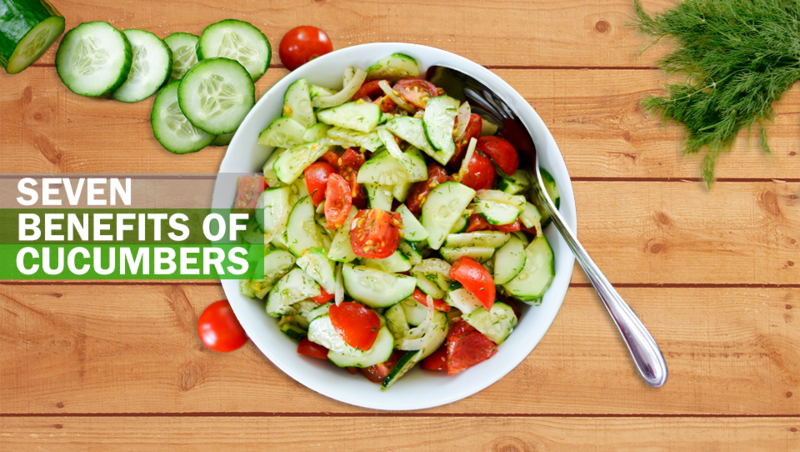 Cucumbers are effective in relieving inflammation internally and externally. Place the cucumber slices directly on the swollen area on the eye and within a few minutes the puffiness is reduced. The high-water content and potassium in the cucumber act as a mild diuretic and fights bloat. Cucumbers have calcium, magnesium and K1, all of which are needed for bone health. Cucumbers can help hair become stronger and shiny. How you may ask. Here is what you do. Juice the cucumber and massage it in your hair after washing it. Let it sit 5 to 7 minutes, then rinse out with luke warm water. Drinking the cucumber juice can strengthen the hair shaft as well because of the silicone, Sulphur, phosphorous and calcium (minerals contained in the cucumber). The list can go on and on but for now: DRINK THEM, CHOMP ON THEM OR USE TOPICALLY, however you choose to include them in your daily diet JUST DO IT. I like to drizzle on extra virgin olive oil when it’s all chopped and ready in the bowl. Please let me know you are enjoying the info and feel it’s beneficial to you or your friends. Until next time, let health be with you!